Daily Mass: Monday-Friday..... 7 a.m.
Sundays ........... 7:00 a.m., 9:00 a.m. & 5:00 p.m.
Confessions: Saturday .... 4:00 p.m. or by Appt. only. 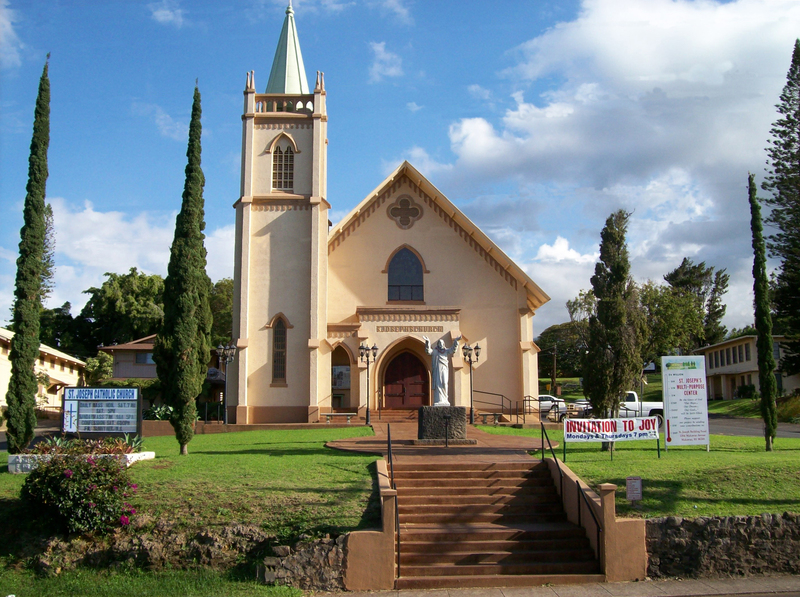 Parish Mission Statement - St. Joseph Church Parish is a faith community in Makawao, Maui. We are dedicated to the call of God, to support the Diocese of Honolulu in its mission, to celebrate the Eucharist, and to commit and make Jesus present in our lives. REFLECTION ON TODAY'S READING: Jesus, humbling himself out of love for us, did not shield his face from buffets and spitting, but offered his life on the cross. He relied on his Father’s love. Friday, May 3rd, 6 p.m.—10 p.m.
Saturday, May 4th, 10 a.m.— 10 p.m.
Sunday, May 5th, 10 a.m.—4 p.m. VOLUNTEERS: There are still shifts left to fill, please sign up, sheets are on the table at the back of church. Let’s work together in supporting St. Joseph Church! SCRIP: Will be available for sale after the Masses this weekend or please stop by the parish office before April 26th. EAST EAST SIDE PARKING LOT: Will be CLOSED OFF after the 5 pm mass on April 28th for Feast prep. FEAST WORKERS MASS: Sat., May 4th @ 10 pm. CONSTRUCTION: Need help putting up the booths and other duties. Please see Jason on Tues.—Fri under the tent. VALUABLE GOODS AUCTION: We are currently soliciting donations for the Live Valuable Goods Auction. If your place of business or family would like to donate a valuable good item (gift certificates, hotel stays, golf rounds, R/T airfares, new appliances, vehicles etc….) for the auction please drop them off at the parish office. All donations are tax deductible. Mahalo! CRAFTERS: Applications are now available at the parish office if you are interested in selling your craft. LIVESTOCK: If you would like to donate any Livestock please contact Louis at 572-8954. COUNTRY STORE: Greatly appreciate donations of bake goods, produce, pickles, etc… Please label your items with ingredients used. Items may be dropped off at the Country Store Booth on the Friday morning of the Feast. DARIO RINALDI ORDINATION TO THE DIACONATE Please join Fr. Jaime in congratulating and praying for our Seminarian, Dario Rinaldi as he prepares for his Ordination to the Diaconate on Friday, July 5, 2019 at 6:00 P.M. at St. Joseph Church. Please mark your calendars for this wonderful ceremony. In addition to the Anointing of the Sick, St. Joseph Church now offers a weekly Healing Ministry. This is a time set aside to bring restoration and wholeness to anyone in need of healing of body, mind, or spirit. IMAGO CHRISTI (in the Image of Christ) is an international healing ministry. You are invited to come and pray for healing with us. Group prayer and specific individual healing sessions are available to all. It is the promise of Jesus that, through Him, we are "to have life and to have it more abundantly.” (John 10:10). Mark 16:17-18 says "these signs will follow those who believe... they will lay hands on the sick and they will recover!" This is a special time of grace for individuals, couples, and families to ask Jesus for healing for our needs and supplications. Let the power of the Holy Spirit fill and restore us with His love! Whether or not you are seeking personal healing, you are welcome to join our Healing Ministry Team. Please call Alda and Jim St. James for more information. The flyer for the Healing Ministry is here. April 19-28th, Please refer to Parish Calendar next week. All are welcome to attend. CONFERENCE ~ will be held on May 24—26, 2019 at the Hawaii Convention Center. Information and registration forms are available on the table at the back of church. 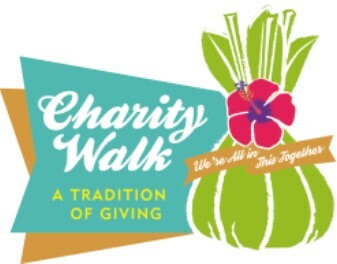 Please walk on behalf of St. Joseph Church at the annual Maui Hotel & Lodging Association Charity Walk on May 11th. The proceeds will go towards the Multipurpose Center & Steeple projects. Applications are available on the table at the back of Church or with your ministry leader. Please submit to office by April 26th. Mahalo! Show times at Regal Theater are 7 pm and at 9 pm. Thereafter, the showing times will change to 1 pm, 3:50pm, 6:40pm, and 9:30pm for several days or weeks. This is the true story of Abby Johnson, a planned Parenthood Clinic Director and her struggles with the abortions that she witnessed. The actress that plays Abby in the movie is Ashley Bratcher. She herself was almost aborted. Our Youth Group News for March 2017 is here! St. Joseph Youth Ministry News for March 2019 is here! The 2019 offertory envelopes are available for pickup at the back of the Church. Please place your name and address on the envelopes for the first couple of weekends. To assure credit to the appropriate account do not use prior year envelopes in 2019. Inactive envelope numbers are reissued to other parishioners. If you would like to receive 2019 offertory envelopes please stop by the parish office. St. Joseph Parish Altar Servers training will be held on Sunday, Mar. 17 & April 14, 2019 at 10:30 a.m. in the Church. Have a few minutes to spend with The Good Shepherd? Come to St. Joseph’s Church on Thursdays for Holy Hour at 5 to 6:30 p.m. On Fridays come & join us to pray the Divine Mercy at 3 p.m. Holy Rosary will be held Monday—Fridays after the daily mass. All are Welcome! MY PARISH APP The app will allow us to communicate with you. It will be a great resource for parishioners by providing daily Mass readings, Catholic news and prayers, convenient prayers and Confession reminders, our bulletin and more. Its free and simple to install, go to messaging, text app to 88202 to download our parish app. Select our Parish after opening. PARISH REGISTRATION Please stop by the Parish Office if you are new to the Parish and would like to register or if you would like to receive a box of collection envelopes. Also, if you have any changes to your address, phone contact, etc.. kindly call the office to update your information. Mahalo! Mahalo for your prayerful support of the most recent WWME weekend held Nov. 16-18! Lives were changed and marriages strengthened as the couples worked to restore communication, rekindle romance, and renew their commitment! The next Worldwide Marriage Encounter weekend will be held at St. Theresa Church in Kihei on November 15-17, 2019. (This is a non-residential weekend.) The quality time together is very impactful. For additional information, please contact Tanya and Lee Barbero at 268-1578. Available at the parish office. 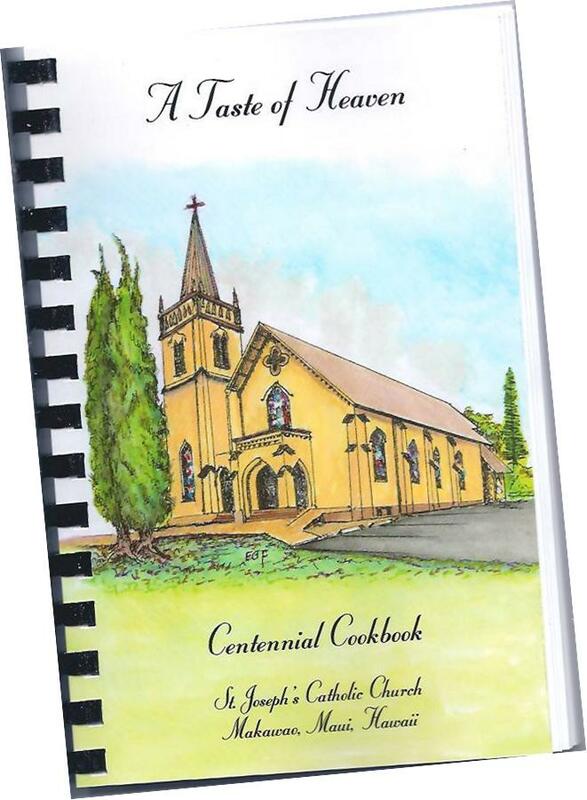 1295 Makawao Avenue, Makawao, HI 96768.
CORRECTIONS TO THE RECIPE BOOK ARE AVAILABLE HERE! Copyright © 2018. 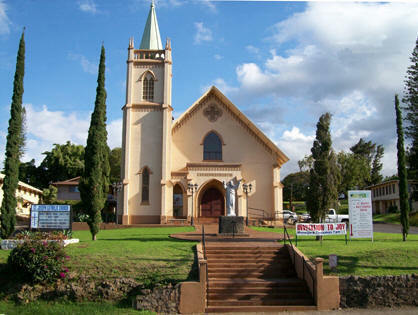 St. Joseph Catholic Church, Maui. All Rights Reserved.